I have been having fun exploring the hoard in my bead cupboard and rediscovered some vintage glass crystals. 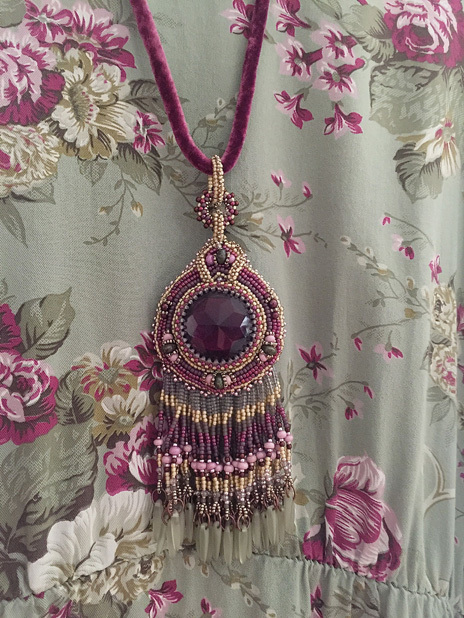 I used one to make a bead embroidered pendant to go with a new dress. 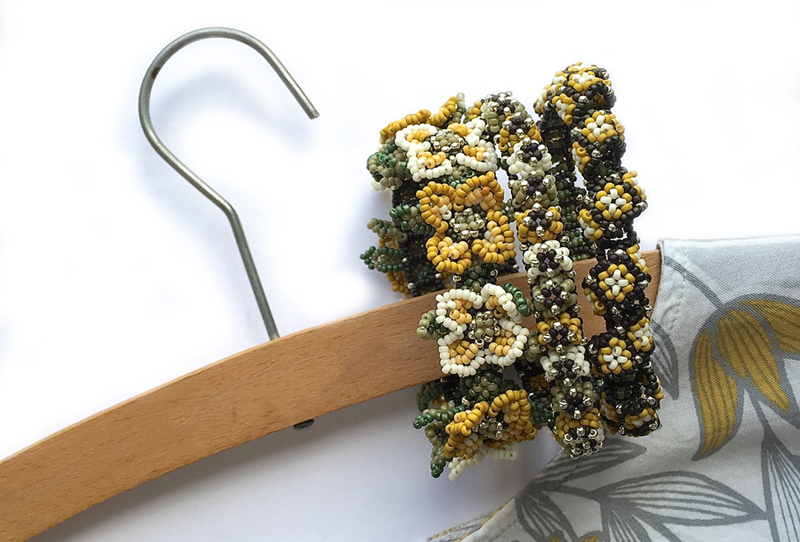 I had so much fun messing around with the beads so I’ve shared the full story on my Heatherbeads blog here just in case you’re tempted to mess around too. I’ve included a fun tip for how to back a clear focal stone. I’m also parting with this hoard of vintage deliciousness, and have just a limited number of the very same clear purple crystals for sale in the supplies section here. 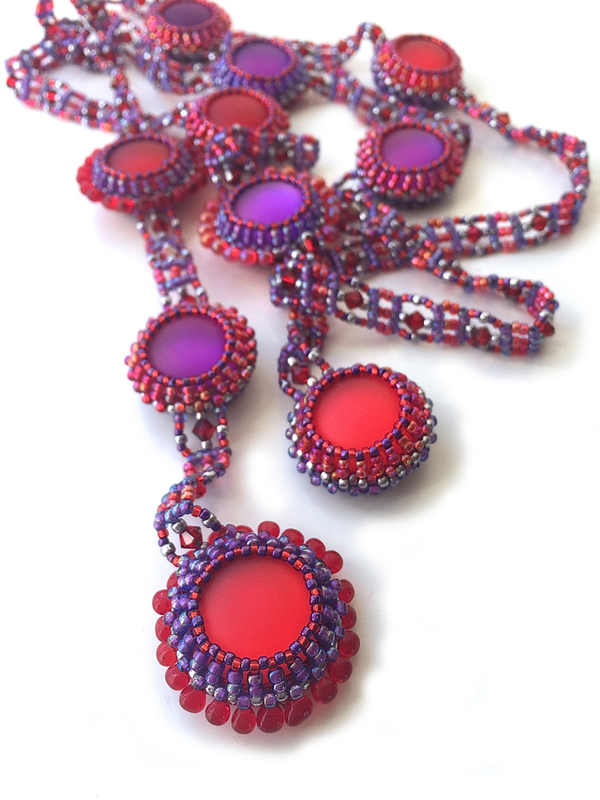 It’s fun being interviewed, some questions leave you thinking, long after you’ve come up with answers, I love the ‘What advice would you give to someone starting beading?’ in this interview. Beginners, my advice is just start, fail, try again and enjoy each moment of learning. 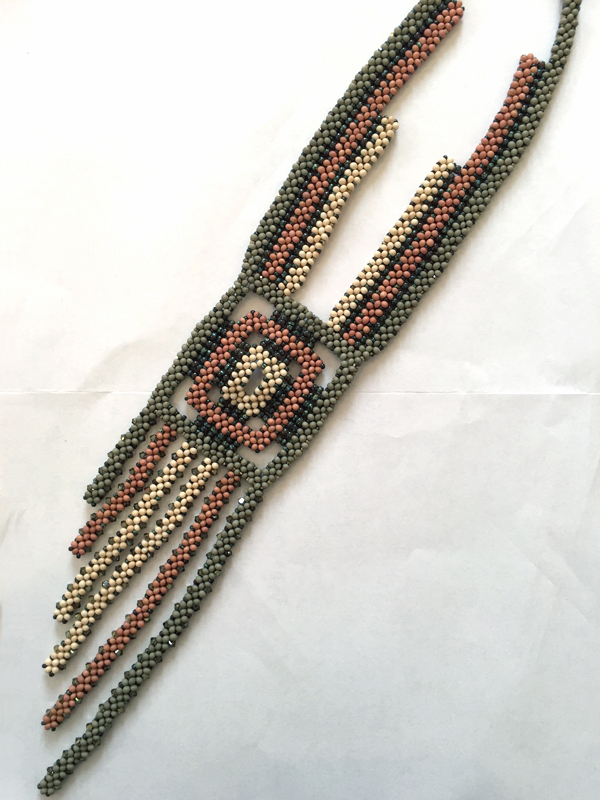 Every time you come back to the beads you will be a little more skilled, until suddenly those really complicated looking patterns won’t look so daunting. I’d also say, find other beaders, we are a huge and loving community and welcome beginners always. Ask, lots of questions, everyone has a tip to pass on, just like any craft. Crafts Beautiful is a colourful magazine with a mix of crafts, papercrafting, sewing, knitting, crochet and jewellery making to try. 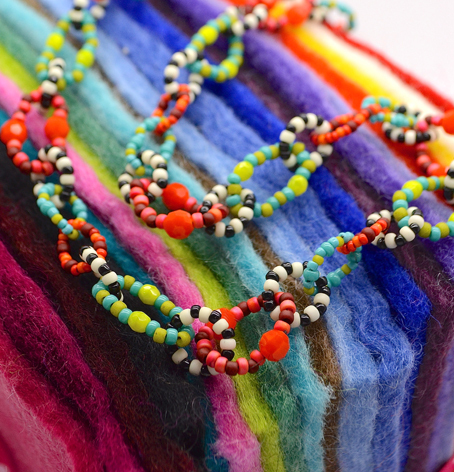 They have a colourful craft filled website too. Aimed towards quick and fun makes with lots of seasonal ideas, hopefully I might just tempt someone to have a go with beads too. It’s hard to believe, as we steam through the hottest summer in a long time, that a few weeks ago it was Spring. 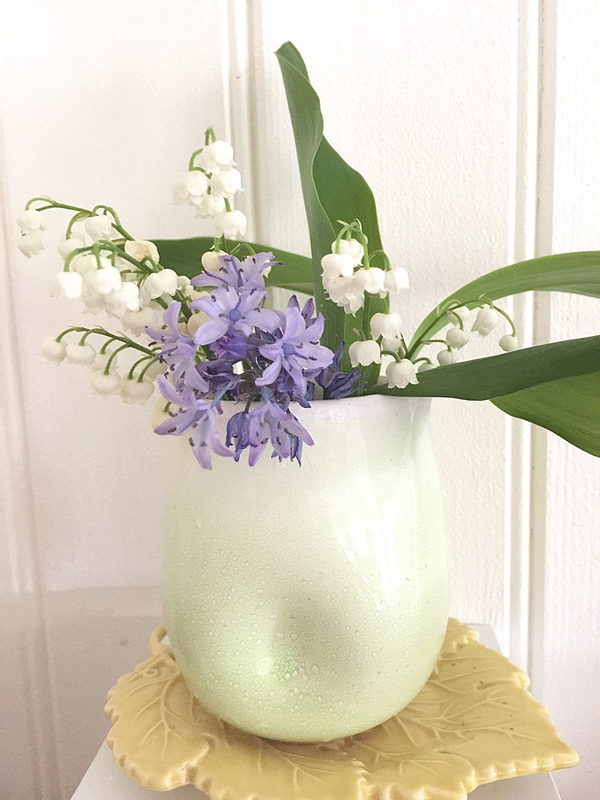 My garden inspiration looks back at the Bluebells and Lily of the Valley. Pure colour candy, the photo is also a celebration of the delicate dimple vase in palest green. Designed and made by Justine Jenner who I met at the Selvedge show, drawn to her work for it’s clean simplicity and fresh colours. The leaf plate is a junk shop treasure in a buttery yellow. 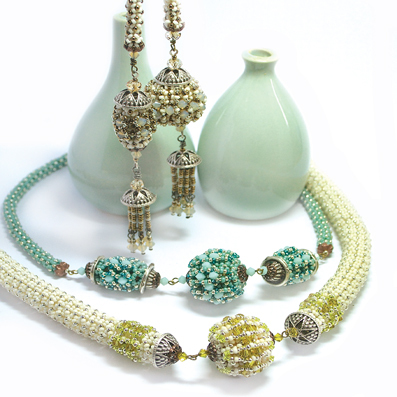 Simple netted ropes from the Ambrosina pattern: if you want to add the beaded beads, you’ll need 4mm bicone crystals in lime or sand opal, 10mm and 8mm end caps plus some head pins. The PDF for Ambrosina is here. I think I may have a problem, of the best kind! My collection of Bump bracelets and bangles is ever growing. 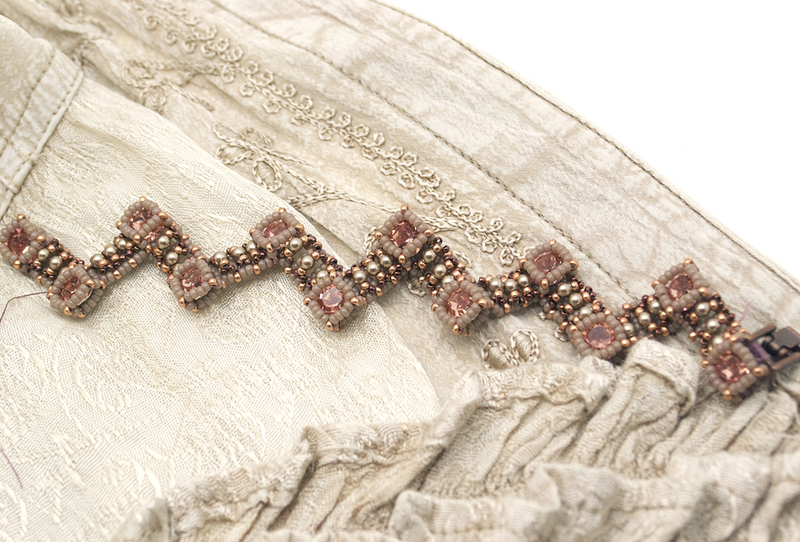 My latest love is for the apricot one I made to go with a vintage silky summer jacket, it uses the intriguingly versatile beige coloured duracoat beads antique cream pearls and fresh apricot sparkly chatons. Now I’m sharing the chaton love with brand new kits for this easy to bead design, in the four colourways I’m wearing most often this summer. If you already have the pattern as a pdf you can choose just the materials too. Find the full kits and materials packs here. And if, like me, you have a sparkly chaton stash in need of just the pattern, the pdf is here. 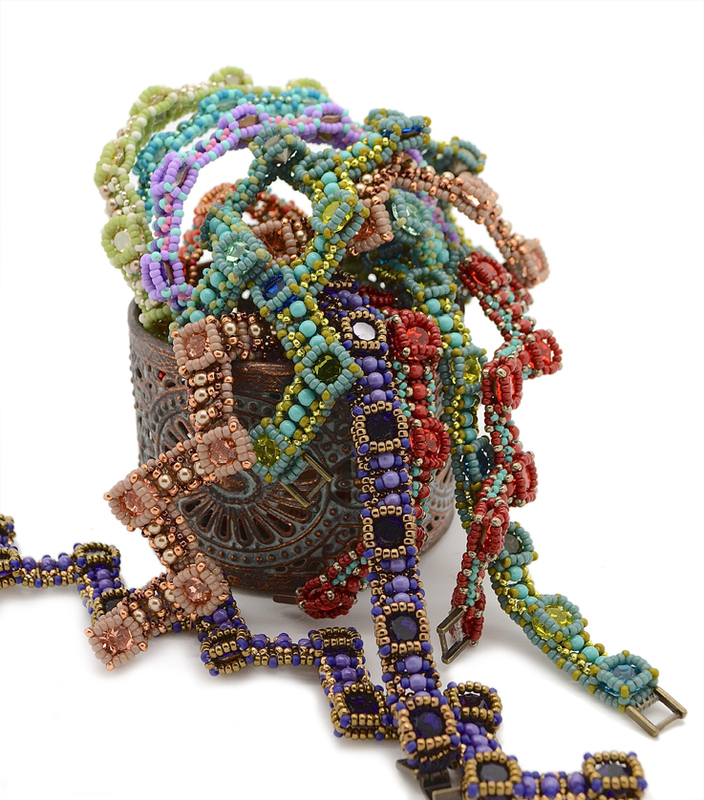 Our time to celebrate all things beady and share the bead love. 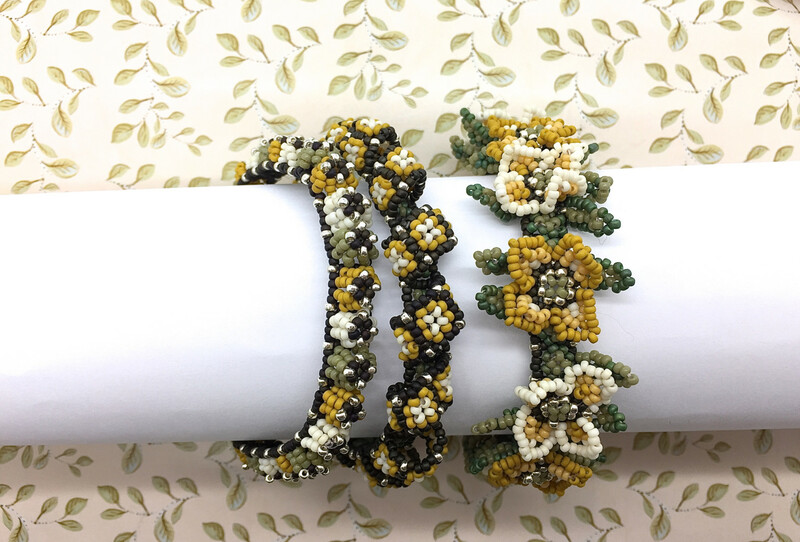 Each year I create a free pattern for the Beadworkers Guild with the hope that you will bead it to show and share it during their National Beading Week. 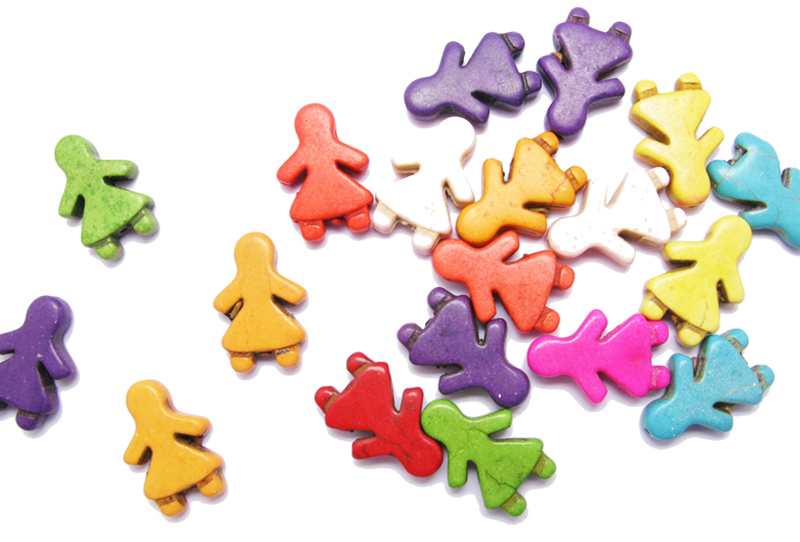 This year’s design is inspired by these sweet little people beads used for a competition last year. The Beady Peeps charm is so cute, it’s worked in albion stitch and, of course, a sparkly Swarovski rivoli. 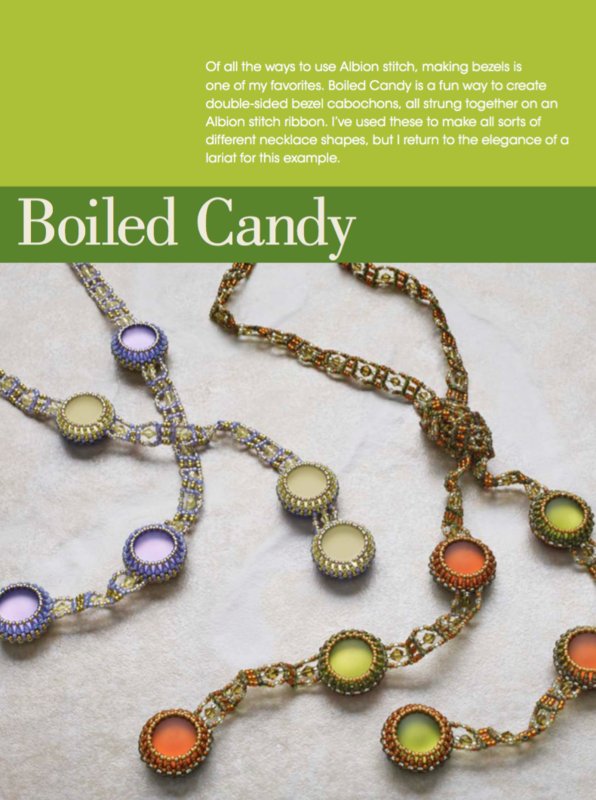 I’ve shared more of the story here on the wonderful lovebeadlove blog page and I’ve included a pretty Magic Chain pattern for free. It’s very easy to do, and great fun too. We can’t wait to see your versions. 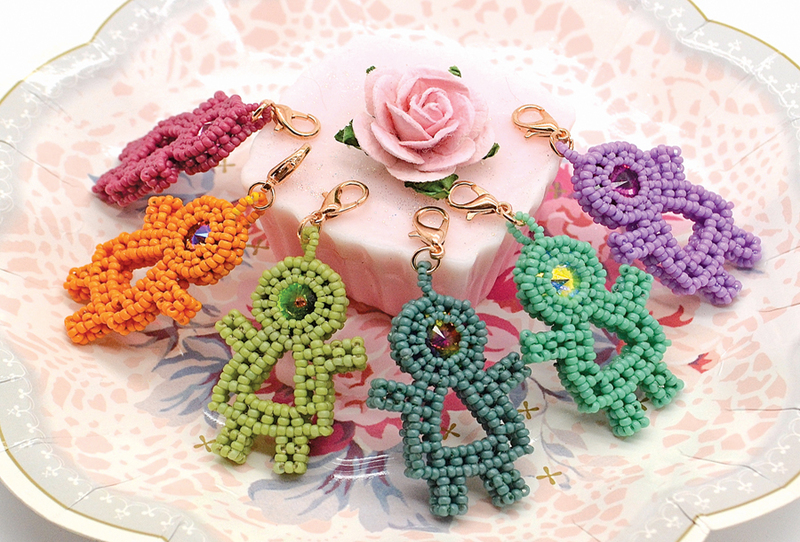 You can download the free Beady Peeps pattern here. 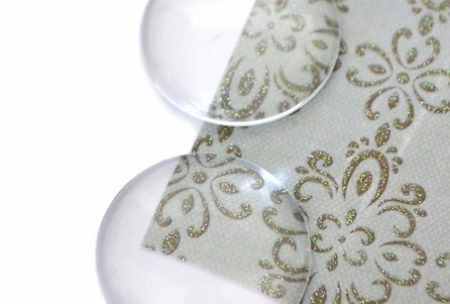 I’ve also made materials packs so if you love my vintage rainbow colours using the gorgeous Miyuki duracoat beads, Swarovski rivoli and rose gold coloured findings, grab yourself one quick, here. 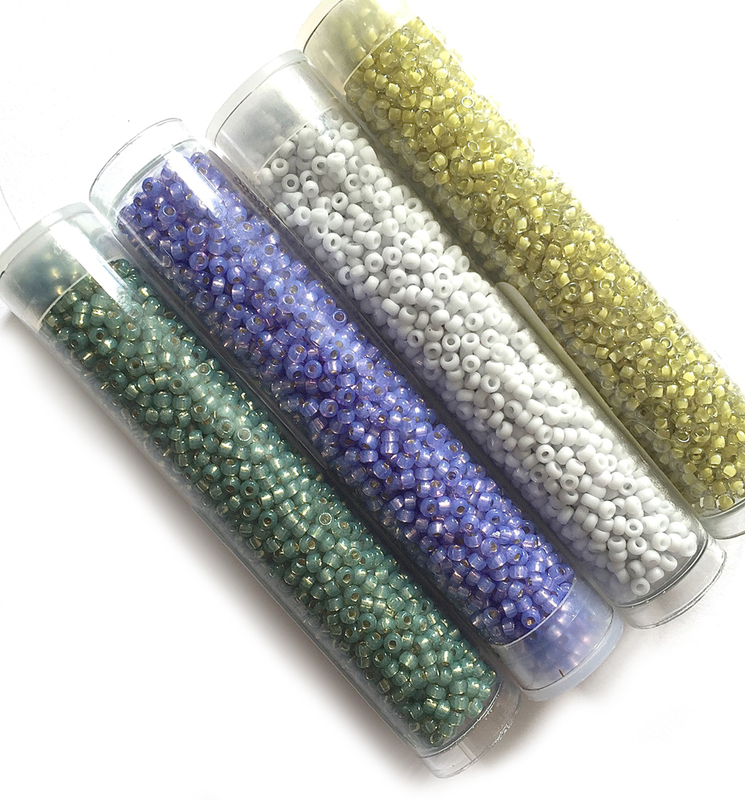 If you want to join in more of the fun, get your local bead store or beading group involved, you can find out more by visiting the official National Beading Week website here to explore the options.